I woke up early that day. Waking up early on a rainy weekend is something unusual for me. But that day I didn't feel going to bed again. After waking up, I stood by the window watching the street next to my home sipping a hot cup of milk. Having milk instead of coffee in the morning. Sounds strange rite??? Well that's me. Ok now coming back, as I stood gazing, my mind was craving to have ada dosa in that rainy weather. As this dosa doesn't require fermentation, I thought of preparing it for breakfast. I soaked all the ingredients. After 3 hours of soaking, I grind the ingredients and prepared a crispy thin dosa with assortments (tomato kara chutney and coconut chutney) to go with. It is most often served with avial with a dollop of butter. If nothing worked out, a simple jaggery will give good pair with this dosa. Ada Dosa can be prepared either in a thick or thin way but I like my adai dosa to be medium thin and crispy with chutneys only. For that reason, I simply grind onion and ginger to a paste and add it to the batter to make thinner version. If you like the thicker version, add sauteed finely chopped onions and ginger to the batter. You can also add finely chopped coconut slices to it. 1) Soak all the ingredients given under batter separately for 3-4 hours or overnight. 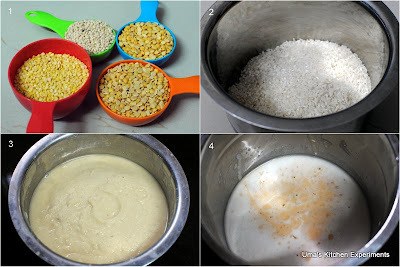 2) Grind both the raw and idly rice together to a thick pouring batter consistency. Add dry red chillies while grinding. 3) Grind the different dals together to a slightly coarse batter. 4) Mix both the batters together. 5) Grind onion and ginger together and add the batter. 7) Add asafoetida and salt as per your family taste. 9) Heat the dosa pan/tawa and spread some oil on the surface of it. (Oil is not required in case of non-stick pan). When you sprinkle water on the pan it raises a typical sound and the water disappears immediately. Its the right time to, pour a ladle of dosa batter. While spreading out the batter, gently spread the batter from the center towards the end of the pan in an uniform motion. 10) Apply less than half a teaspoon of oil on to the corners of the dosa. 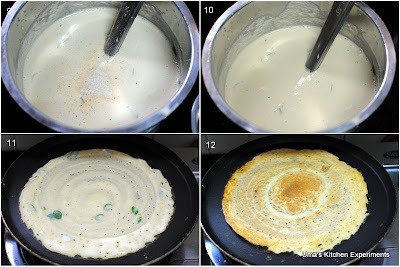 11) When one side of the dosa is cooked, turn/flip to other side and allow it to cook. 12) When both the sides are cooked, transfer the dosa to the serving plate and serve with any chutney. 13) We enjoyed it with Tomato kara chutney, Coconut Chutney and Jaggery. 1) Increase or decrease the red chillies quantity as per your taste. 2) Skip drumstick leaves if you didn't get it. 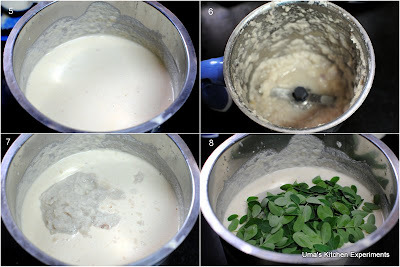 Instead increase the quantity of coriander leaves and curry leaves quantity. beautiful adai dosa...I recently made one and loved it...Yours looks perfect!! liked your thin adai dosa..
yummy breakfast recipe, looks tempting and delicious... nice presentation. Never thought of adding onion and ginger paste. Actually have never added ginger to adai, but it would add a lovely taste to it. Wish to start my day with this healthy and nutritious adai. Perfectly made & looks so nutritious!! ahh...tasty!!! my craze towards adai is always high.. i love the addition of drumstick leaves .. Lip smacking, healthy perfect dosas!!!! The chutney looks yummm too!! !